Private Nature Retreat setback from Black Road in Ranchero SE, This 1 Acre Property offers a rejuvenating, inspiring & unique European design perfect for an artist, writer or creativity inspiration! 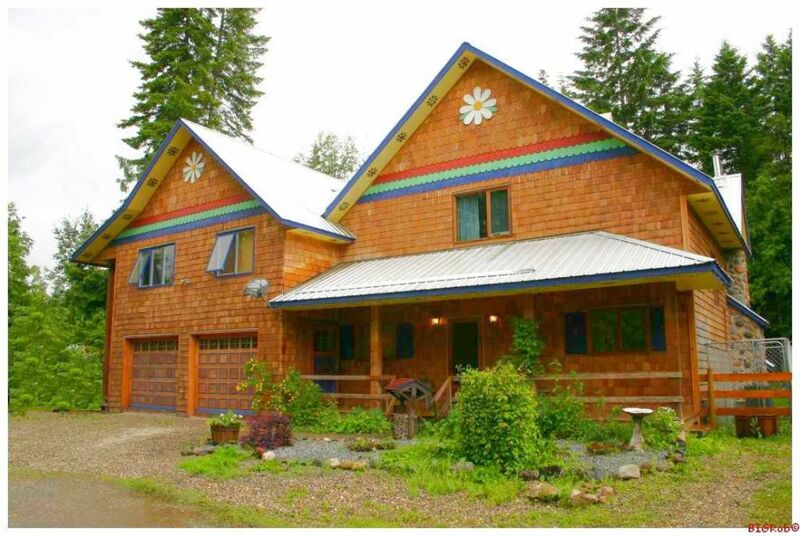 Tons of Wood including Cedar siding, Wood Vaulted Clgs, Wood floors & Windows. Metal Roof, Hot Tub Included, Air Conditioning w/Forced Air Furnace with dual fuel that includes wood burning. Huge vaulted ceilings with cascading wood stair architectural feature including a bridge balcony that spans to a study/reading room in the turret tower! Wood burning FP in Living Rm, Eat-In spacious Kitchen with double glass french doors opening onto the hot tub deck. Huge walk-in shower & soaker tub, Main floor laundry, covered porch entry & Sundeck. There is also a separate Fully Furnished in-law suite! 2 sets of appliances including W/D's. Double attached garage, RV parking, Fenced dog run w/Built-in dog house, Sheds, Chicken coop, Firepit & your own forest w/Trails. Great well, IHA approved Septic, High Speed Connections, Pan Handle style Road off In addition to the photos here, check out our comprehensive photo slide shows of both the interior and exterior of this home and property... YOU'll love the room by room tour of this wonderful property.... Check this out and then call Rob Today! YOU'll be glad YOU Did!!! FULL SLIDE SHOW PRESENTATION : CLICK HERE! Email: SOLD@BIGRob.ca Thanks for your interest! Give Yourself An Environment That YOU Can Dream In! The property is located in Southeast Salmon Arm amongst other acreage style homes approx 1 km off Hwy 97 B along Black Road. The road is paved all the way, and regularly ploughed in winter. Located close to the amenities of Salmon Arm (3 min), Enderby (10 min), Vernon (35 min), and Kelowna (1.1 hrs). The Kelowna airport is approximately one hours drive away. There is a small airport in both Salmon Arm and Vernon. Ranchero is centrally located to enjoy all that the Shuswap and Okanagan have to offer from the beaches of Mara and Shuswap Lakes, to hiking in Mount Revelstoke National Park, to the cultural life of downtown Kelowna.